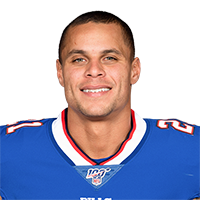 Published: Nov. 25, 2018 at 04:14 p.m.
Buffalo Bills safety Jordan Poyer is in the perfect spot to intercept Jacksonville Jaguars quarterback Blake Bortles' tipped pass. Published: Oct. 14, 2018 at 02:34 p.m.
Houston Texans quarterback Deshaun Watson avoids a sack then throws a pick in the end zone intercepted by Buffalo Bills safety Jordan Poyer. Published: Oct. 7, 2018 at 03:25 p.m.
Buffalo Bills safety Jordan Poyer dives to recover fumble from Tennessee Titans running back Dion Lewis. Published: Sept. 30, 2018 at 02:15 p.m.
Buffalo Bills safety Jordan Poyer intercepts Green Bay Packers quarterback Aaron Rodgers for an 11-yard interception return.